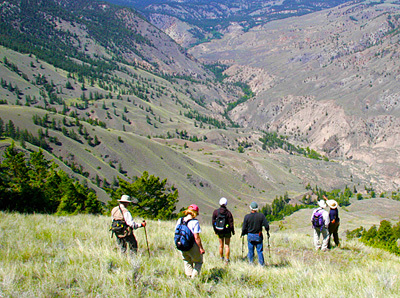 Friends of Churn Creek Protected Area Society is a non-profit organization formed in 2009 to help BC Parks achieve the conservation and cultural heritage vision for Churn Creek Protected Area (CCPA), as outlined in its management plan. Churn Creek Protected Area includes outstanding representation of British Columbia grassland ecosystems, among the most rare and threatened ecosystems of the province. The grassland ecosystems and wildlife of the Protected Area are of provincial and national significance. The area also has a long history of importance for First Nations people and ranching culture. The Friends of Churn Creek Protected Area Society’s logo is adapted from an ancient petroglyph of a bighorn sheep drawn on a rock near the protected area. It is endorsed by the Stswecem’c Xgat’tem First Nation and was developed in cooperation with Keyboard Graphic Design. Facilitate public input to management planning for CCPA.